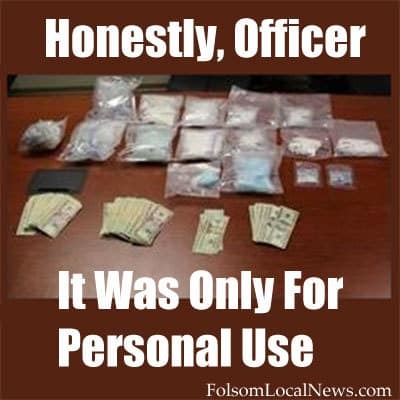 Folsom Police Department Detectives arrested two men Wednesday (8/14/2013) after a two month investigation. The Folsom Police Department’s Special Investigation Unit was assisted by the Sacramento Sherriff’s Department HITDA team. The men had a large quantify of methamphetamine, heroin, and cash, which police seized. 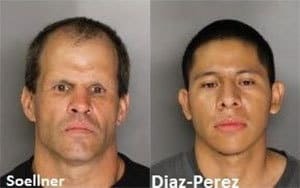 The police investigation centered on Orangevale man, Edward W. Soellner, 45, because he was suspected of supplying methamphetamine to residents of Folsom and Orangevale. Tracing back to the source of Soellner’s supply lead them to Francisco DeJesus Diaz-Perez, a 23 year old man in Santa Ysidro. S oellner’s residence was in the 5600 block of Walnut Ave, and while police were serving a search warrant there, Diaz-Perez arrived to deliver an additional quarter pound of crystal methamphetamine to Soellner. Searching the Soellner home, detectives located more methamphetamine, $1,680 in cash, and evidence of drug sales. While searching Diaz-Perez’s vehicle, police found a hidden compartment. Next, Special Investigation Unit detectives obtained a search warrant for an apartment in the 6400 block of Verner Avenue, that Diaz-Perez used to store, weigh and package narcotics for distribution. During the search, detectives located approximately more than five pounds of crystal methamphetamine, almost four pounds of black tar heroin, and over $13,000 in cash. Methamphetamine is highly addictive, yet it is in demand, and the seized drugs have a street value of $112,800. If these drugs had reached the street, many more people may have become dependent on crystal meth, and many lives would be destroyed, and not only the addicts. Police said Soellner was booked into the Sacramento County Jail on the charge of Possession for Sale of a Controlled Substance. Diaz-Perez was booked on charges of Possession for Sale of a Controlled Substance, Transportation of a Controlled Substance, and the Possession of a False Compartment in a Motor Vehicle to Conceal Controlled Substances.